Our Sunday night special offer breaks are an excellent way of taking a short break at the weekend. The Sunday night offers usually provide the best value for money and are very popular with our customers. Our Sunday night specials usually consist of an overnight stay at the hotel, dinner on the night of arrival, a full breakfast the following morning and use of the spa/leisure facilities. Although some venues do offer extra incentives to book the Sunday package such as afternoon tea or even a spa treatment for each guest. Every offer is different depending on the hotel. These deals are available throughout our hotels across the UK. Browse through the areas below to find your perfect Sunday spa break. If you have any questions or require any further information please contact us on 0800 246 5511. You can also get in touch through our live chat or by sending us an online email enquiry. Originally a country house, the Stone House Hotel has been tastefully restored in traditional style to provide a charming and serene environment. The hotel boasts beautiful gardens and guest facilities that include a superb restaurant with original fireplaces and views over the hotel gardens, lounge bar with Sky Sports, free WIFI, indoor swimming pool, sauna and gym. The hotel is situated on. . . The Towers Hotel, Swansea is a family-owned hotel where a warm, friendly welcome combine with high standards of service and cleanliness to ensure that your stay is a pleasant one. Offering first-rate facilities for business travellers, conference organisers, those getting married or looking for a place to eat and drink in comfort, The Towers, Swansea is also a great place to. . .
Mercure Walton Hall Hotel and Spa sits in 65 acres of beautiful English Countryside, just 10 minutes off the M40, making it an ideal location for a spa break near Stratford-upon- Avon and Warwick. This once quintessentially stately home has been carefully restored to offer a luxury retreat, parts of which date back to the 1500's. The Estate boasts 197. . . Guests are welcomed to this modern country house hotel set amidst glorious Leicestershire countryside. Located close to the motorway network and convenient for visiting the Midlands major cities, this Best Western 4 star hotel benefits from a 18 hole championship golf course, leisure centre with beauty rooms & comfortable accommodation. An 18 hole championship length golf course offers challenging greens and. . .
Mercure Brandon Hall Hotel and Spa Warwickshire is a 4 star hotel, a former manor house which sits on 17 acres of peaceful grounds. During your stay, enjoy access to the private members Spa Naturel Health club, combining fitness, hydrotherapy and spa treatments for the ultimate in wellbeing. The Spa which is on two levels offers a fully equipped Technogym. . . The Hallmark Hotel Gloucester is one of the finest hotels with a superb location on the edge of the Cotswolds just 2 miles from the city centre and 5 minutes from the M5. The Hallmark Hotel Gloucester offers a stunning selection of 95 spacious bedrooms. Each of the stylish rooms offered at our accommodation in Gloucester has a flat screen LCD. . .
You will find a choice of dinner options including the Two AA Rosette awarded Willow Restaurant, which creates the perfect setting for you to appreciate fine cuisine and a carefully selected wine list. Panoramic views of the gardens, freshly prepared locally sourced food and attentive service combine to ensure you have a memorable dining experience. If you're looking for something. . .
Settle in and experience the world-class luxury of the award-winning Belfry Hotel & Resort, from the iconic greens to the sumptuous bedrooms. Surrounded by over 500 acres of countryside, The Belfry introduces luxurious guest bedrooms and suites, meeting and event rooms, restaurants, bars, a nightclub, a luxury Spa and Health Club and of course amazing golf. With 319 en-suite bedrooms, and. . . The Hallmark Welcombe Hotel & Spa is a destination that can suit all guests needs, from the stunning hotel exterior to the relaxing spa area. Why not treat yourself to a round of golf on the 18-hole Championship golf course or test your skills on the hotels private tennis courts. This venue is a destination in its own right, Located. . .
DoubleTree by Hilton Cheltenham Hotel is the perfect place to lose yourself on a spa break in the Cotswolds. Amble through the rolling fields, cycle or walk up hills and take in the quaint villages. Enjoy a day at the races, if you’re lucky enough you might get to see the Cheltenham Gold Cup, the premier event of the National Hunt. . . The Park Plaza Cardiff, is a four star hotel located in the centre of the city, within easy walking distance of the historic Cardiff Castle, St David's Shopping Centre and shopping arcades, The Principality Stadium and Cardiff City Hall. With 129 modern bedrooms, The Park Plaza Cardiff is both modern and glamorous; offering Superior Rooms, City Hall Rooms, Executive Rooms. . . Situated in the North West corner of Shropshire, yet surrounded by the North Wales Borderlands, there is so much to see and explore; and being situated between historic Chester to the east and the dramatic Snowdonia National Park to the west, it’s a place where there is truly something to delight everyone. Even better, the Lion Quays Hotel sits on the. . . Inside this beautifully-restored Georgian house, 15 luxurious contemporary bedrooms and luscious designer bathrooms – the perfect place for a long lazy weekend break (in a dog friendly hotel!) or mid-week stay to discover this fascinating county, for a Shropshire wedding or family celebration, or for a relaxing Spa retreat. We have excellent facilities for disabled guests with a bespoke ground. . . The four star Thornton Hall Hotel & Spa is located just 20 minutes from Liverpool and Chester, nestled in the Wirral Countryside. It is also conveniently located for anyone looking for spa breaks close to Manchester, Merseyside & North Wales. 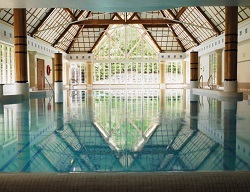 With one of the finest Spa’s in the North West, offering an amazing array of treatments and packages to suit everyone. . .
Billesley Manor Hotel can be found minutes from the M40, just outside Stratford-upon- Avon where you can engross yourself in the literature and life of Shakespeare and plunge yourself into the land of historic England. A beautiful country retreat with modern bedrooms and a fine dining restaurant, Billesley Manor Hotel captivates the very essence of Central England. Billesley Manor Hotel. . .
Kenwick Park Estate is set within an Area of Outstanding Natural Beauty in the heart of the Lincolnshire Wolds in the idyllic market town of Louth. The estate offers 3 star hotel and luxury woodland lodge accommodation along with a new £5 million Club & Spa which opened in 2016 and outstanding 18 hole golf course. The new ClubSpa is. . . The elegant 17th-century Hatherley Hotel is set in the midst of the glorious Gloucestershire countryside with extensive mature gardens, a walled garden and orchard, all within its own 37 acre private estate. Just ten minutes’ drive from the city centre, this charming country house blends history, luxury and modern comforts to perfection. The spacious en-suite rooms, many with views of the. . .
Once a grand family home, The Elms Hotel and Spa, an inspiring Queen Anne mansion, is set in ten acres of Worcestershire countryside overlooking the Teme Valley and is as striking inside as it is out. A four-silver star country house hotel has twenty three bedrooms in the main house and individually designed, richly furnished suites situated in the annex.. . .